On December 7, 1941, the nation of Japan attacked Pearl Harbor and prompted the United States' entry into the bloodiest war in human history. Americans have long debated the cause of the bombing; many have argued that the attack was a brilliant Japanese military coup or a failure of US intelligence agencies or even a conspiracy of the Roosevelt administration. But despite the attention historians have paid to the bombing of Pearl Harbor, the truth about that fateful day has remained a mystery-until now. 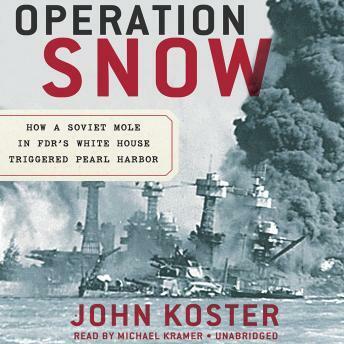 In Operation Snow: How a Soviet Mole in FDR's White House Triggered Pearl Harbor, author John Koster uses recently declassified evidence and never-before-translated documents to tell the real story of the day that FDR memorably declared would live in infamy. Operation Snow shows how Joseph Stalin and the KGB used a vast network of double agents and communist sympathizers-most notably Harry Dexter White-to lead Japan into war against the United States, demonstrating incontestable Soviet involvement behind the bombing of Pearl Harbor. A thrilling account of espionage, mystery, and war, Operation Snow will forever change the way we think about Pearl Harbor and World War II.